Colorado Treasurer Walker Stapleton discusses retirement, the energy industry and education with Moffat County Commissioner John Kinkaid and Moffat County Republican Chairwoman Brandi Meek. Visiting Northwest Colorado is important to Walker Stapleton because he wants to connect with area voters, but he was also excited to visit on Thursday because he got to tour Trapper Mine. “I think it’ll be totally fun to throw on a hard hat and see all of it,” Stapleton said. Stapleton is Colorado’s Republican treasurer running for a second term this November against Democrat Betsy Markey. 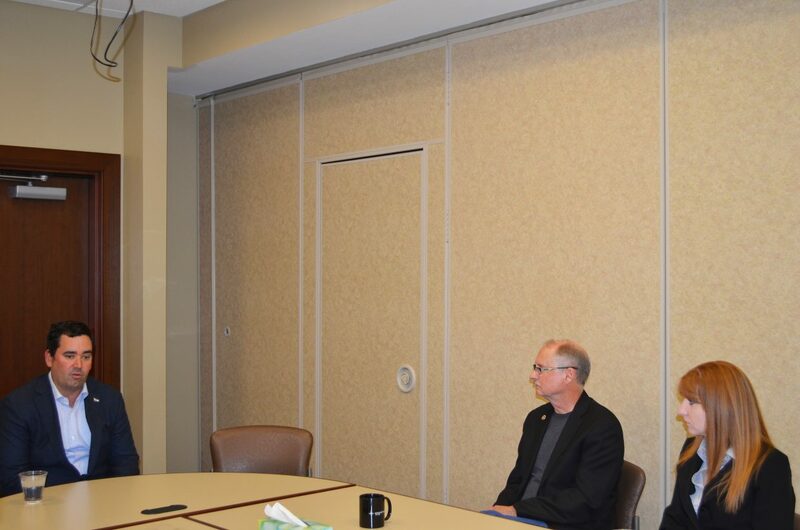 He stopped by The Memorial Hospital in Craig on Thursday to talk with Moffat County Commissioner John Kinkaid and City Council member Ray Beck, among other community members. Topics of conversation included Colorado’s retirement system, education funding and energy industry. Stapleton raised concerns about Colorado’s retirement system and said the system makes promises it cannot keep. Moffat County Democrats chair Jo Ann Baxter said she “disagrees vehemently” with Stapleton. “All I know is that I am a recipient of that system, I’ve watched very carefully and it has posted remarkable gains in the last couple of years,” Baxter said. She said part of this gain comes from the upward swing in the stock market. Beck raised Western Slope-specific economic concerns to Stapleton. “I sometimes feel like they’re living in a bubble because they don’t know what it’s like on the western side of the continental divide,” Beck said of encouraging economic announcements from Gov. Hickenlooper about Colorado. This led Stapleton into discussing how the energy industry impacts Colorado’s economy, and particularly Western Colorado’s economy. Stapleton is not happy with the proposed fracking compromise that the Colorado legislature discussed, which involved allowing counties to place their own moratorium on fracking operations. “What’s going to happen is a practical implication or a manifestation of that policy is the drill operator is going to pick up and move elsewhere,” Stapleton said. Baxter thinks fracking is a part of Colorado’s energy industry, but should be handled with caution. “I think it can pose some hazards, but has some viability if we manage it properly,” she said.